"Look Mr.Camper stop complaining its too easy"
The best thing about this map is the layout. I like the routes between the bases and the way you can change between them in many places. This is a map where you can hunt a human (if you get out of your own base). I also like the plain, colourless lighting and the tall corridors it makes them negotiable as a hatchling and still easy to sneak by a grunt if necesary (being grey and harder to see under dark white lighting). But the spiders base is really easy to camp. Anyone can stand outside and spray a clip of autogun rounds under the door as it opens. I am really glad I didn't get the chance to play this map while the HT had a mortar otherwise this review could have gotten ugly. 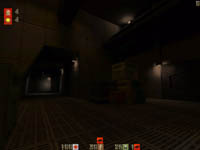 Also the eggs are difficult to defend against a commando or exterm who charges into the base, jumping over spikershots and leaving a trail of nasty grenades. Having said this I haven't played rage with gassers so I wont let it affect the score I give. This map doesn't look too hot and has a really bad spiders base but I still like it. Its good to play spiders on, if you can get out of your own base. Comment: Variety is the spice of life, and this tastes like stale bread. Comment: I like this map, but the spiders base is a well designed camping spot. Comment: Nothing bad. I like the tall and thin feel (non inuendo, well not the thin part). Comment: I like this map, sorry I can't help it. I like the dark tall corridors and the many possible routes between bases but it is campable. This review has been read 1701 times. The Gloom Map Depository is copyright Team GMD. Quake2 is a registered trademark of Id Software. Gloom is copyright Team Reaction. The review script is copyright R1CH.